Can Conservation Banking Save The Prairie Chicken? Its habitat fragmented and shrinking, the Lesser Prairie Chicken has seen its numbers plunge from more than 34,000 at the beginning of last year to less than 18,000 in August. Here’s how a massive mitigation banking effort aims to save the bird by preserving and re-creating large swaths of contiguous prairie to achieve a sustainable, landscape level outcome for the species. 4 December 2013 | Wayne Walker wasn’t exactly surprised when he read the report, but the numbers still hit him hard. Entitled “Range-Wide Population Size of the Lesser Prairie Chicken: 2012 and 2013” and written by environmental consultancy Western EcoSystems Technology, the report showed there were less than 18,000 of these small grouses this year – down from more than 34,000 last year and from numbers in the millions just a half-century ago. The birds are disappearing because their habitat is shrinking and fragmenting, which is a severe threat for a species that needs thousands of acres to thrive. Those that remain are confined to a rangeland that is between 7 and 9 million acres – about 15% of their original habitat. 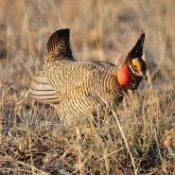 Their numbers are plunging despite voluntary efforts to keep the bird off the endangered species list, and Walker believes it’s time to seek new solutions and is launching a massive conservation banking effort – one that will more than triple prairie chicken rangeland as it also consolidates habitat into a few sites of more than 10,000 acres each. Walker first learned of the prairie chicken’s plight nearly 15 years ago, while developing wind energy projects across Texas, Oklahoma, Kansas, New Mexico and Colorado. These “green” projects, he found, weren’t exactly a boon to prairie chicken habitat. That prompted him to gradually switch careers – from being an energy developer to a conservation bank developer. He already had the background for it with a master’s in Environmental Studies (where his thesis was called “Rejuvenating Rangeland: An evaluation of Juniper Management techniques on the Edwards Plateau in Southwest Texas”). Last year, he created Common Ground Capital (CGC), a conservation banking company that aims to create several prairie chicken species banks across five US Great Plain states. So far, CGC has secured 86,000 acres of land spread across three states, and each bank will provide at least 10,000 acres of uninterrupted prairieland – a drastic improvement over the fragmented state of affairs today. The lesser prairie chicken is a North American bird species living in the grassland, sagebrush and shinnery oak ecosystems within the US states of Kansas, Oklahoma, Texas, Colorado and New Mexico. Famous for elaborate mating performances, prairie chickens used to be widespread. But habitat loss from agricultural land conversion and fragmentation has reduced that large population to small pockets living in particular areas of the states. This year’s deep decline has increased the probability of the chicken being listed as threatened or endangered under the Endangered Species Act (ESA). The bird has been a candidate for listing since 1998. An ESA listing would mean federal protection for the species and would enforce regulations to conserve the chicken’s habitat even if it fell on private property. Rather than wait for the species to be listed, Walker has decided to start his conservation bank portfolio approach – where several banks for the bird is created – proactively. It’s a risk, because if the bird doesn’t get listed, demand for “chicken credits” would be marginal at best. If it is listed, however, companies will need special permission to impact the habitat, and even if they get that permission, they will have to mitigate their damage by supporting the offset of habitat impacts of equal or greater value than what they’ve damaged. By establishing banks based on ecological principles, Walker will be able to create several contiguous habitat areas where now only scattered fragments exist. The US Fish and Wildlife Service (FWS), which administers the ESA, will make a listing decision on the prairie chicken in March. No matter what the decision is Walker says conservation banks are necessary. The oil and gas and wind sectors of the energy space would be key buyers as they are a main threat and their activities, like pipelines, well sites, wind turbines and other infrastructure, are targeted for development on top of remaining chicken country in many cases, Walker says. “Chicken banks are arguably the first real effort to port the conservation banking model into a landscape-scale mitigation model,” says Walker. To date, conservation banking is an approved method under the FWS to preserve species and is usually used on an area of 100s of acres or occasionally over 1,000s of acres. The chicken banks are designed to conserve an area of 10,000 acres at minimum. That’s the lowest estimated level of land needed to support a viable population. Over time, Walker says, they expect the banks to grow. While Walker would be interested in a multiple species bank, he hasn’t found a need or market opportunity in chicken habitat that overlaps with other species. The first step in the process is to work with the FWS on their “strongholds,” which are areas of between 25,000-50,000 acres of permanently protected chicken habitat. The FWS has advocated that protecting strongholds in each of the ecosystems the bird lives in is fundamental to the remaining population. Walker and company then move into restoring habitat and continuing to re-connect the landscape through habitat corridors over time. A steady supply of multiple buyers will be needed in order to sustain this landscape-level arrangement. “Not many single customers will be able to purchase all of the credits of a 10,000 acre minimum bank,” says Walker. A steady supply of support from partnering state agencies through the Western Association of Fish & Wildlife Agencies (WAFWA), NGOs, companies, and private landowners is also critical for a new initiative like this to succeed. The past July, Walker’s company, CGC, partnered with one of the largest environmental restoration and mitigation banking firms in the country, Restoration Systems (RS). RS brings to the table both financial and institutional/market knowledge, capital and a lot of human resources to assist in executing on the prairie chicken banking strategy, Walker says. The private landowner is especially important to the banks because these banks allow for the landowners to remain on their land while it’s being used for conservation. This requires good relations between the bankers and landowners. Traditionally in conservation banking, the land is bought for the sole use of the species. CGC meets with landowners and explains their approach to conservation banking. They perform onsite development activities like the vegetative analysis and “lek” (the chicken’s mating area) surveys. They then go through the regulatory process for approval under the FWS to sell credits. Walker acquired good working relationships with landowners while covering the same geography in wind development learning how the ranching and farming economy works and what drives these landowners’ decisions. He realized that in order for these ranchers and farmers to consider prairie chicken conservation equally with their land operations, compensation for change must equal or surpass their traditional income. Walker doesn’t foresee real change if there is only a small increase in earnings. “You have to pay a premium for culture change so the people on the landscape see that it will make a big difference in their livelihoods, both for the present and future generations,” he says. Landowners in this region of the country are independent, Walker says, so they would be more inclined to practice conservation if they are able to stay on the land and be in control of decisions. For the banks, landowners receive a large portion of the revenue share from the credit sales. Their existing operations are also likely to have indirect benefits, according to Walker, because of a non-wasting endowment the FWS requires banks to have. The endowment is a perpetual fund for bank management. It’s actually critical that banks form partnerships with landowners because of the amount of land the bird requires. CGC can’t afford to buy the total acreage needed with prices ranging from $500-$1,000 an acre across the five state range of the prairie chicken, Walker says. With less than 20,000 prairie chickens left, it’s critical to create a robust framework that ensures their preservation, and Walker believes this framework will affect the entire conservation banking industry, and CGC has plans to use the lesser prairie chicken model for other species like the Greater Sage Grouse in the future. The Lesser Prairie Chicken Range Wide Conservation Plan was created by the WAFWA in collaboration with several NGOs, the energy industry and other stakeholders to preserve the species and mitigate harmful impacts with the goal of avoiding an ESA listing. Walker admits that this effort is arguably the largest collaboration among multiple states to chart a regional course of conserving the species. But unfortunately, Walker says, instead of basing the mitigation strategy around proven tools like conservation banking, the plan relies on un-proven models that aren’t long term solutions. Walker says the models the Conservation Plan is using are based on government payment programs that have a poor record of conservation success despite the millions of dollars invested in them. These alternative or voluntary mitigation strategies to compliance are also performed at a lower standard than what would be required under a listing status. Walker has been involved with voluntary mitigation and would argue outside of a few industry leaders, most companies are not going to voluntarily change their behavior. It requires them to incur a cost which their competitors don’t have to incur, thus creating an unlevel playing field between competitors, he says. “This species and the industry need certainty all around, and you just aren’t going to achieve that with an over reliance on un-tested mitigation programs that have both a high probability of not working and being litigated,” Walker believes. Realistically, the only way you are going to get a better outcome for the species and have true behavior change among the different interests is to list it under the ESA, says Walker. Even with this listing, the stakeholders will still have a voice in the mitigation process.